Those perfect flesh tones in the portraits of Velázquezavailable for today's artists. n 1624, in Madrid, Spain, Diego de Velázquez stood before his easel. Opposite the great artist stood Philip IV, King of Spain. As the light from the window fell on the young monarch's face, the artist dipped his brush into the white pigment, then into yellow ochre, and finally into mercury vermilion, the warm red then in use. The artist's brush swirled the three pigments together, producing just exactly the shade on the king's forehead. Three hundred years later, in New York, a young Russian emigré, beginning his art studies, stood before another Velázquez painting in the Metropolitan Museum of Art. That swirl of three pigments still lay glistening on the painted face. Experiments on the student artist's palette (substituting cadmium red light for vermilion of mercury) confirmed the mixture. The young art student was Samuel Edmund Oppenheim (1901-1992) who became a leading American painter and teacher. His popular classes in oil portraiture at the Art Students League of New York (1966-1972) were innovative and influential. Oppenheim continued his studies of Velázquez throughout a long painting career. Oppenheim's years of intimate and painstaking scrutiny and analysis of Velázquez paintings resulted in a series of pigment formulations, which Oppenheim considered fundamental to the structure of a Velázquez portrait (for a detailed description of the pigment combinations, click on "Descriptions of the Oppenheim/Velázquez Pigment Combinations" below.) These pigment formulations were passed on to Oppenheim's students at the League. These formulations included three pigment combinations for light-struck areas (in the normal Caucasian complexion), two combinations for transitional, or "halftone" areas, and two darks for shadow areas. These seven pigments had to be further modified by the inclusion of additional colors to precisely match the observed phenomena. In other words, the Oppenheim/Velázquez pigment combinations were not "formula" colors, but simply starting points for the final color mixture, to be arrived at through traditional observation-based analysis and adjustment. Pigment Combinations Is Sponsored by the Art Students League of New York. Stewart Klonis, Executive Director, The Art Students League of New York, who made possible the manufacture of the Velazquez/ Oppenheim pigment combinations, which became known as the Pro Mix Color System. 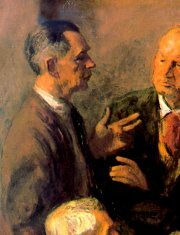 Detail of the painting Homage to Sargent by Robert Phillip. 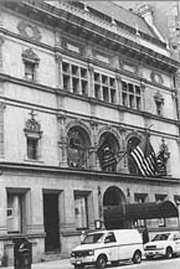 Collection, the Art Students League of New York. In 1972, Samuel Oppenheim retired from teaching at the Art Students League of New York, and I was hired to teach his class. Eager to perpetuate his teaching concepts, I formulated the pigment combinations that he had given us, and asked the Martin/F. Weber Company of Philadelphia to produce them. The Weber Company, the oldest American manufacturer of artists' colors, had been founded by Frederick Weber, longtime lecturer on artists' techniques at the Art Students League. This fact inspired me to approach Stewart Klonis, Executive Director of the League, with the proposal that the League serve as financial sponsor for the colors, which by now had been christened the "Pro Mix Color System." Mr. Klonis took the proposal to the League's Board of Control, which voted unanimously to fund the undertaking. Thus the Velázquez/Oppenheim pigment combinations, rechristened the "Pro Mix Color System" were born, in 1974, with the League's blessing and financial backing. In the 32 years since, the colors have been purchased by 50,000 artists around the world. 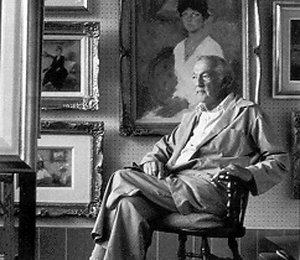 Many of the world's leading professional portrait artists are devoted to their use. Over the past three decades, these portrait pigments have been the object of occasional criticism by artists not familiar with their use, the principal charges being that they are "formula colors" or "shortcuts." These charges are unwarranted, and I would like to answer them definitively in the next article in this space. Descriptions of the Oppenheim/Velázquez Pigment Combinations (Today's Pro Mix Color System). Returning to the Oppenheim/Velázquez pigment combinations, it is important to repeat that these were based on a close scrutiny of the visible paint film on Velázquez paintings, both in this country and in Europe. Oppenheim concluded that there was a basic pigment combination that recurred constantly throughout the Spanish master's oeuvre. That combination is best rendered today by combining white, yellow ochre and cadmium red light. Of course, cadmium colors did not enter the standard list until the nineteenth century. Velázquez used vermilion of mercury, a warm intense red, now obsolete. Five of the Oppenheim/Velázquez combinations are based on this three-pigment combination: white, yellow ochre and cadmium red light. Oppenheim gave us these three pigments in three slightly different variations, introducing a touch of cerulean blue into two of them, and numbering the combinations Light 1, 2 and 3. Light 2 is slightly darker and more intense than Light 1; Light 3 is darker and more intense still. Oppenheim returned again to this three-way combination to produce two transitional, or halftone colors. Starting again with white, yellow ochre and cadmium red light, he added a touch of viridianenough to produce a soft, delicate greenish halftone color, especially valuable when painting receding planes on the Caucasian face. He called this Halftone 1. A second halftone color was achieved by reducing the amount of viridian and introducing a touch of cadmium orange, producing a warm, rich halftone color especially useful where light and shadow areas meet. For the shadow areas, Oppenheim gave us a powerful, very proactive pigment combination he had extrapolated from his study of Velázquez: combining burnt sienna and viridian produces a rich dark brown, adding cadmium orange enriches the mixture still further. This volatile mixture can easily be moved from warm to cool and vise versa. A touch of white mixed into this dulls the intensity slightly and raises the value. Hence the two "Pro Mix" darks, Dark I and 2. To quickly reduce the intensity of all colors, the use of neutral greysin various valuesare placed on the palette for convenience. Mixing ivory black with white, and adding a touch of yellow ochre for warmth, three neutral tones are created: Neutral 3 (33-1/3%), Neutral 5 (50%) and Neutral 7 (66-2/3%). These grays are positioned on a value scale of nine tones, with white being zero, and black, value 9. Putting the Oppenheim/Velázquez Pigment Combinations (Today's ProMix Colors) Into Practice. The Traditional Protocol for All Color Mixtures. 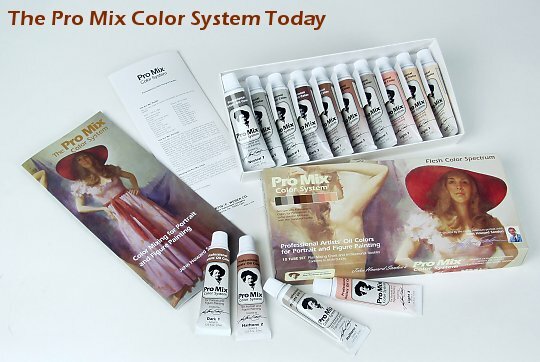 The traditional protocol for all color mixtures is a four-step procedure. First, the artist observes the natural phenomena. Second, looking down to the palette, the artist selects the single pigment that appears closest to the desired destination. Third, the artist must analyze the difference between what is observed and the color on the knife or brush. Does the selected pigment need to be adjusted in hue (made warmer or cooler)? Does it need to be adjusted in value (made lighter or darker), or does it need to be adjusted in intensity or, perhaps, all three of these? The fourth and final step is to make the necessary adjustments, by introducing into the mixture additional, and necessary, components.